The CRF450RX with a pure moto-cross DNA to deal with any special enduro stage and has the confidence-inspiring competence to handle flat-out trails, challenging climbs and tight, tricky sections with ease. The CRF450RX is something truly special, not just for Honda, but for the enduro world to ride and race. It looks different and feels different to the rest of the pack. And, just like the new CRF450R, it is compellingly fast. The 2017 CRF450RX is identical in almost every area to the 2017 CRF450R, but has some crucial changes to create an uncompromising enduro focus. Both front and rear suspension are less firm, with lighter compression damping and a lower spring rate for the shock. It uses an enduro-standard 18in rear wheel, and sidestand and 8.5L fuel tank are also added for practicality and extended range. The CRF450RXs PGM-FI ignition timing map produces softer power and torque delivery than the CRF450R to aid traction feel in awkward conditions. Electric start is fitted as standard. 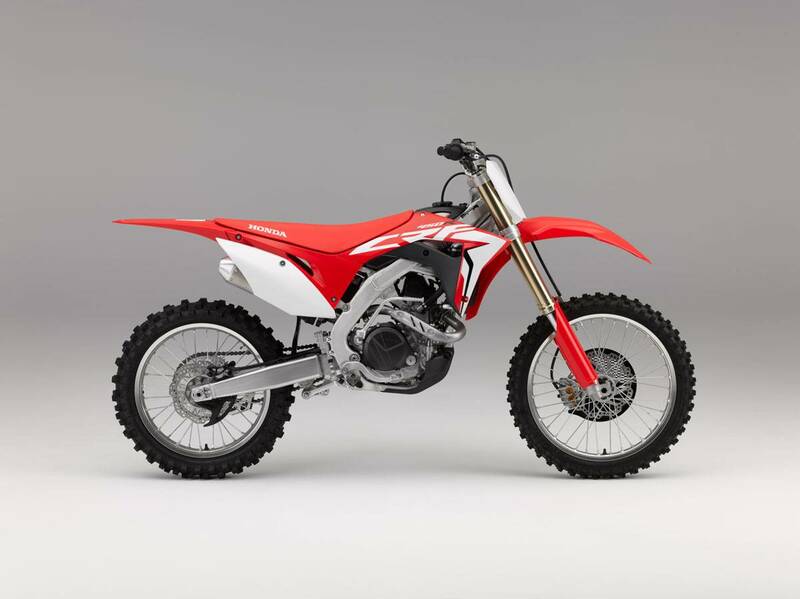 The CRF450RX uses the seventh generation CRF aluminium beam frame with improved turning performance, front-end stability and traction. It also delivers greater rear wheel drive with elevated levels of rider feedback and predictability. Tapered main spars have 100% of the lateral stiffness of the previous frame, but torsional stiffness is 6.8% less to improve turning ability and feel. The frame weighs 9.14kg; the extruded rear subframe 1,045g. Seat height is 959mm. Rake and trail are set at 27.4°/116mm. Total wet weight is 118kg. 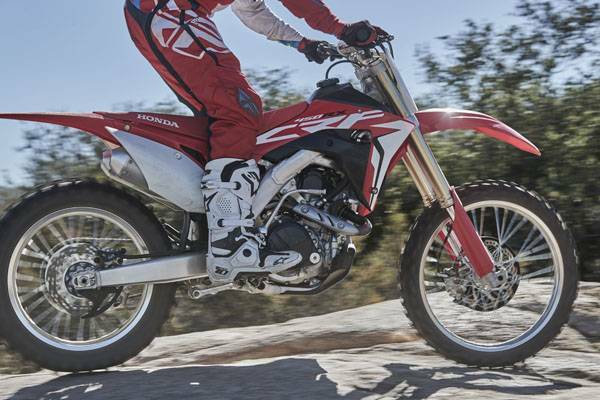 Several subtle changes to the geometry and dynamic parameters have been made compared to the outgoing CRF450R, all of which give considerable benefits to both moto-cross and enduro riders. The centre of gravity height is 2.7mm lower. The wheelbase is 1482mm. Distance between the front wheel axle and swingarm pivot is 913mm, with distance from swingarm pivot to rear axle only 569mm. This geometry transfers more weight to the rear wheel for outstanding traction. A four-valve Unicam cylinder head, with a finger rocker arm on the inlet valves, gives inlet valve lift of 10mm; exhaust valve lift is 8.8mm. Inlet valve diameter is 38mm and 2-way valve seat machining smooths gas flow. The downdraught intake provides a direct, straight shot to the inlet ports. Narrow valve angles of 9° intake and 10.5° exhaust, plus a redesigned flat-topped piston, boost combustion efficiency. A 4-hole piston oil jet reduces piston temperature and deals effectively with the increased temperatures generated by the high compression ratio. Both the piston pin and finger rocker arms have a DLC coating (Diamond-like Carbon) for excellent abrasive resistance. Equipped with a fully adjustable 49mm Showa USD coil spring fork - a version of the Showa factory fork supplied to MX race teams in the Japanese national MX championship. The cylinder features a 25mm diameter, with a 14mm rod and 39mm compression piston. The forged aluminium side stand tucks high out of the way and attaches to the frame at the left footpeg mount via a stainless steel bracket. 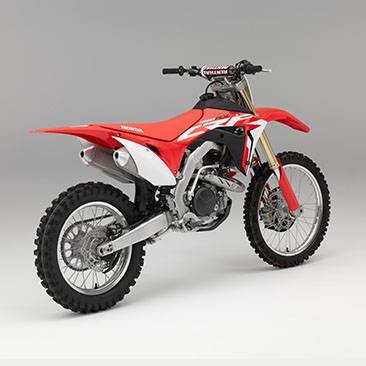 Like the CRF450R, the bodywork uses durable film inset graphics that cover a wide area with scratch resistant style. Please note the CRF450RX is not ADR compliant and is purely just a competition model here in Australia.